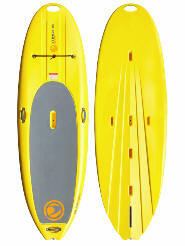 The new Surfer is the ultimate board for anyone just getting into stand up paddling. Wide, stable and easy, it will get you out there and onto the waves “right now.” As good as it is at the beach, the Surfer is great to cruise pristine lakes, and explore backwater bays and inlets. 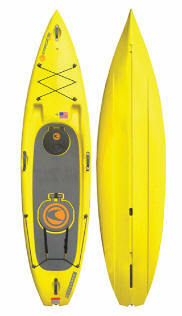 From yoga enthusiasts, to kids at play, or anyone simply wanting to tan out on the water, the Surfer brings it all. The Fit is the ultimate fitness and touring machine. The uncluttered standing area, allows the Fit to be super versatile for racing, touring, or recreational use. 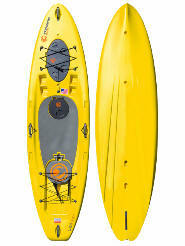 The plum bow and efficient hull design slice through the water, giving the Fit excellent glide. Full deck EVA pad, front deck bungee, four carry handles and the snap in race fin all come standard making the Fit a great value package. Blow molded polyethylene. 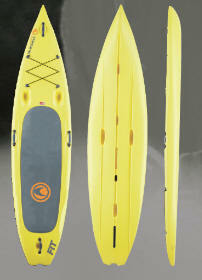 Dimensions: 11' x 30" x 8"
It’s rewarding when every time you take a stroke, you feel the board accelerate. The Speeder is our fastest sub-race class design and you feel it every time you pull. The wave-piercing bow and rounded narrow hull cuts smoothly through the water while the surf tail allows you to surf ocean swells. Large hatches provide “overnighter” storage, and finally, our built-in seat back and footrest means it can be paddled like a kayak. Recreational Stand Up Paddling was never as varied and fun as it is with the Wizard. From simple evening paddles after work, to all day fishing trips, to paddles down the coast, exploring bays and estuaries, this SUP has you covered. Large hatches for easy access to the inside, a flip up seat-back and heel rests so you can paddle it seated, fishing rod holders, deck bungees for storage, and more. 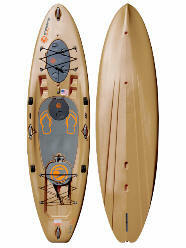 evening paddles after work, to all day fishing trips, to paddles down the coast, exploring bays and estuaries, this SUP has you covered. Large hatches for easy access to the inside, a flip up seat-back and heel rests so you can paddle it seated, fishing rod holders, deck bungees for storage, and more.